Horse owners look forward to spring, and horses do too. But first you have to get through winter, and mud season, and shedding season. There’s a lot of work to do before spring even gets here. The most important plan you need to have is how to make sure your horse doesn’t suffer from laminitis this spring. The biggest majority of laminitis cases happen when horses are turned out on green grass. Yet out of every group of horses, some will handle the grass just fine, while others will develop telltale lameness. Which group would your horse be in? And do you know? Use our list of suggestions to get ready for spring. Be prepared for the emergency of laminitis, and hope that you won’t have to worry about it. You need to see your horse’s feet when they are freshly trimmed. Look for signs of blood, a flat sole and a stretched white line. Ask your farrier if your horse’s feet looked this way on the previous trim. Exercise and a change in diet will help your horse’s feet. 1. Is your horse at risk for laminitis? Any horse can get laminitis. Your horse may have been the one who never got laminitis in the past, but horses change. As they age, their metabolism changes. They are more susceptible to Equine Metabolic Syndrome (insulin-resistance) and Cushings disease. Obese or “easy keeper” horses are at especially high risk. 2. Have you moved your horse or has your pasture changed? Changes in the grass itself, the size of the pasture available, the number of horses in the paddock, and the number of hours and time of day your horse is turned out can affect the laminitis risk. Even the weather can affect how much carbohydrate is in the grass. 3. How much are you feeding your horse? Grain, hay and grazing each contribute calories and carbohydrates to your horse’s diet. If your horse is on grain, start cutting back before the grass comes in. If your horse is overweight during the winter, he will have a significant increase in calories when the grass is added in the spring. Don’t just look at the foot; look at what the farrier has trimmed off, before your dog can grab it. Is the white line tight or is it stretched and deformed like this hoof clipping? 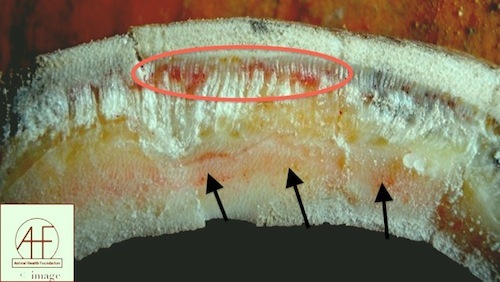 Arrows point to area of hemorrhage where the coffin bone pressed on the sole; circled area shows blood in the stretched white line. 4. Have you had your hay tested? You probably don’t know if your hay has more or less calories than last year’s hay. If you think there is any possibility that your horse is at risk for laminitis, you can soak your hay. Visit safergrass.org for information on soaking hay from Katy Watts, a researcher funded by the Animal Health Foundation. 5. 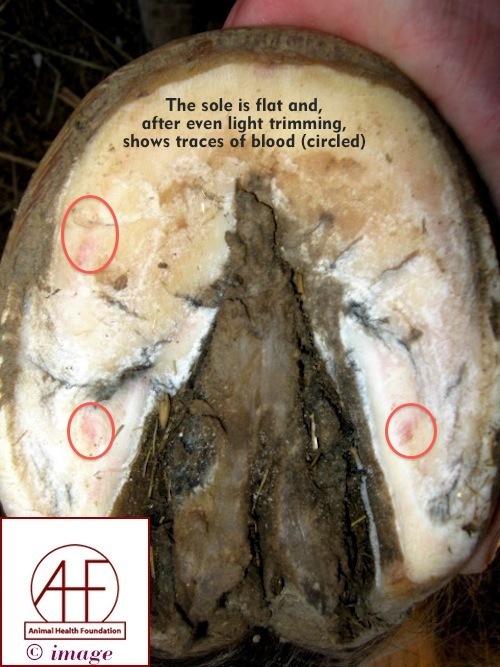 What is the condition of your horses’ hooves? Schedule a spring appointment with the farrier and be there when she or he trims your horse’s feet. Look for a stretched white line, tiny signs of blood in the white line, and rings on the outer hoof wall. These are possible signs of insulin resistance and should be considered warning signs. Whether you see those signs or not, it is a good idea to take photos of your horse’s feet. 6. How much does your horse weigh? How much did he weigh last year? Get a weigh tape and follow the instructions to compute your horse’s weight. Plan to use the tape again, once a month, through the spring. 7. Have you felt your horse’s ribs lately? Your horse will probably be shedding a lot in March. While you are brushing your horse, feel the ribs, or try to. Did you feel them in the fall? Are you using a different hole in your girth, or have you said lately that you need to get a bigger girth? These are warning signs that your horse is overweight. Grab your camera and take some photos of your horse’s feet from closeup, like this. You can show these photos to your vet and have something for comparison if your horse’s feet get worse--or better! 8. Do you have supplies for laminitis? If your horse has had laminitis before, you may already have a halter muzzle, styrofoam hoof blocks, supplies for icing your horse’s feet, Soft-Ride boots, poultice, and other supplies in your tack trunk. Pull them out and see that you are well stocked for another year, even if you don’t need them. 9. Does your horse show subtle signs of foot discomfort? Do you notice that your horse doesn’t stand patiently when you clean his feet or does he suddenly not want to lift a foot for you? Is your horse less active during turnout than he used to be? There are many reasons for these problems, but a predisposition to laminitis is high on the list. 10. Can you get your horse into a daily exercise program? This might be the most important thing you can do for your horse’s feet. Just fifteen minutes each day of lungeing or working your horse in a round pen can make a big difference in your horse’s metabolism. It is also easier to exercise a horse that isn’t lame. Losing some weight and adjusting the metabolism will decrease the risk of your horse developing laminitis. What are you doing to anticipate spring for your horses? Does your barn or farm have a plan? Use the comment form below to tell the Animal Health Foundation what you are planning for this spring, so other horse owners can learn from your good ideas! As always, thanks for supporting the Animal Health Foundation and giving feedback that puts you right in the middle of laminitis research.